I think book week may be jinxed. Already on day two I fell off the book wagon. I have excuses, but excuses are boring. So here we go! First of all, I stand corrected: "Zakka" means "household goods." Which goes to show that I should never write about a book when I'm in one location and the book is in another. Pardon me. And my thanks to the kind person who commented and then disappeared. You were correct; where did you go? So have you seen this book yet? And are you familiar with Lena Corwin's work? She was writing for Bluelines, the now-defunct blog of the (also defunct) Blueprint magazine. And she's a blogger in her own right, too. Well, Lena is a very talented textile artist and illustrator and the author of this recently published book. I haven't seen any other books like this before; in fact, the last good printmaking book I read was a college textbook (which was considerably less attractive and didn't have the great projects included, either). Lena's book covers stamping, stenciling, and screen printing, and the projects themselves are contemporary and inspiring. While some of the projects involve printing on paper, walls, and furniture, quite a few of them use fabric. Which, of course, makes me so happy. Lena's work has a wonderful and unique style. The projects are varied, and they're presented beautifully. And envelope at the back of the book includes patterns for all of the designs (and there are a lot of them! ), but you could easily make your own designs using Lena's techniques, if you're so inclined. As an added bonus, my dear friend Brooke designed the book itself. Everything Brooke touches turns out perfectly (in my personal opinion--after all, Brooke does the visuals for Oliver + S, so I'm not biased in any way), and this book is no exception. The styling and photography are outstanding, and the page layouts are really clean and attractive. I dug out the dog fabric for this shot. This is vintage fabric purchased from Brooklyn General a while ago. Love dachshunds. Love dachshunds printed on fabric. Must print my own dachshunds on fabric one of these days. Can't wait to try Lena's techniques for it. By chance, I ended up with two copies of this book. Actually, I purchased one while on vacation because I couldn't wait until I got home to read it, it's that good. So I have one to give away. Leave a comment of any sort, and The Great Dr. S and I will do a drawing in a few days. Just for fun. And because we like you. Here's to book week. May it and the stock market settle down soon. I'm loving your books so far -- don't worry about falling off the wagon. :) Such a generous giveaway! I love that dog fabric. I have always wanted to get into printmaking. From what you've shown the book looks great. wow, looks great, it's nice reading a book like that that has great visuals- inspiring! Thank you for sharing with us. I would love a chance to win the book. Thank you, what a lovely giveaway! I recently had my first try at printing on fabric - it was loads of fun. I foresee a world of printing in my future. What I need - another thing for my ccrafty to do list. Why not? This book looks like it could actually spur me on to completion. I've been looking at printmaking lately and trying to decide on a book...thanks for the wonderful suggestion. I love book week!! It just keeps getting better and better. Whoa! Have a drawing and the lurkers come out! hehehee - Love your book week! 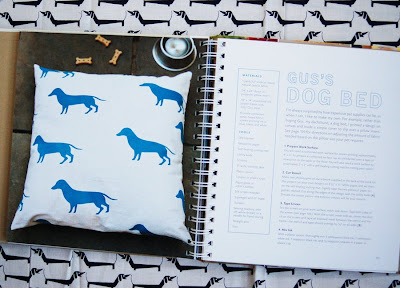 Both of those dachshund fabrics are SO FABULOUS! I must have that book (In other words, "Pick me, pick me!"). Love that fabric! I've had my eye on this book since it came out...it looks fantastic. I already checked out this book from our local library and it's really great. More inspiring than Lotta's book, I think. Lotta's book makes me think, oh handprinting seems like fun, while Lena's book makes me think , yes I can do this! What fun. I'm not sure that I would ever try printing fabric myself. But the process certainly is interesting. I always love your book weeks. Oooh. I've this one on my "must read" list for awhile. You have such a terrific collection of books! Looks like a whole lot of fun! Thanks for the giveaway. I love reading your blog! Thanks for sharing the book with all of us. enjoy the blog and hope I win! This books looks wonderful. It may even inspire me to make a dog bed for my mini dachshund. Thank you for your review! I saw the book at Barnes and Noble, and it looked pretty good to me, but it is helpful to have an "expert" opinion! oooh. what a pretty book. would love to win it. and try it out. oh I'd love to win this book! Ooh! I love the dachsunds too! My dad and his girlfriend have one, therefore I have a brother named Ross Weiner. I might have to blatantly copy that freezer paper stencil style for a Christmas present. Woohoo! You've inspired me to, um, go to Brooklyn General for some shopping. Actually, I think I put this book on our wedding registry--another thing to confuse our friends & family--but no takers so far. I think the most confusing part is that I'm the "artsy crafty" person in the house, where really I'm sure my husband is the one who'll use this book more. i'll add my name to the contest! i've looked at this book many times online. looks fantastic, i'll have to add it to my wishlist. thanks! Don't worry about falling off the wagon, but please keep sharing the book love. I always want to go to the bookstore after your book posts. That looks like a truly awesome book. Thank you for sharing it with us. Just what I need - another creative idea for working with fabric! But the book looks great. Thanks for introducing us to all of your great finds! I use commercially available fabrics for my baby shoes (or reclaimed fabrics), but this review just gave me so many ideas! If I don't win it, I'll have to buy it! i've had my eye on this book but have, thus far, resisted the temptation to delve into more projects. but if i won it... well that would be a different story! I would love this book (it is currently in my Amazon wish list). It seems like a great start for doing your own printing! I also added the zakka book too to my wish list after seeing your post! Keep up the book week. So awesome. the book looks really cool, I love her creativity and help in sharing it with the rest of us. Thanks for your generosity. I'd love a chance at winning the book. It is on my list of books to get...maybe I'll get this one! 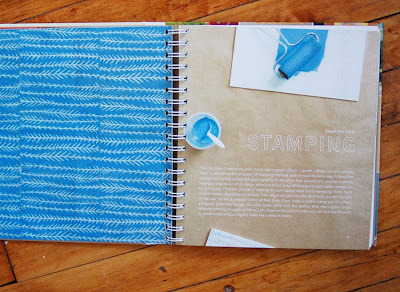 Ohhh this book would be perfect to use with the alabama stitch book!! Don't you just love natalie?! I've been thinking about buying this book, actually, but have resisted thus far out of fear of adding more things to my endless craft to-do list. But how could I resist this? Note to self: Must make dog bed fabric and then dog bed for my Black Lab, Reuben. My copy is on backorder, so I would loooove to get my hands on this book and then giveaway when it's my time. i have been trying to decide on a book like this to buy. lotta jansdotter's looks interesting too. but maybe this one has more variety? hmmm. . . decisions decisions. maybe i should get both? win one here ; ) buy one of amazon. . . I have been so keenly interested in screenprinting lately and it sounds like this would be the perfect book to learn more about it and give it a go. I've read very nice things about this book and am very intrigued by it. I've been curious about this one! I would love to hear what you think about Lotta J. 's book in a future book week too! please add my name to the list. I've recently re-discovered knitting and would love to discover a new love...I already love stamping (also, put on hold since child #2...) but since the kids are getting older (and love to craft- YEAH!!!) we are digging into my trove of supplies together an rediscovering together. I have been checking out both the "Zakka" and the printmaking book. Loved both. But since I was looking for a book on how to make books, I showed strength and resisted... Can't wait what you will show us next. By the way, I had a dachshund as a child named Hannchen vom Heiligenberg - short dog, long name! Pick me Tsia, pick me! OOOOh, it looks fantastic! Thanks for the review. oh I've been wanting that book!! Glad to hear it is so good. Thanks for the giveaway! I enjoy reading your blog. Your book week is going to get me in trouble. I am absolutely addicted to books and it's always neat to find books you didn't know about. If I'm not too late, I'll add my comment in hopes I can win this awesome book. This book looks seriously great! Thank you so much for the hint. I keep hearing about this book. 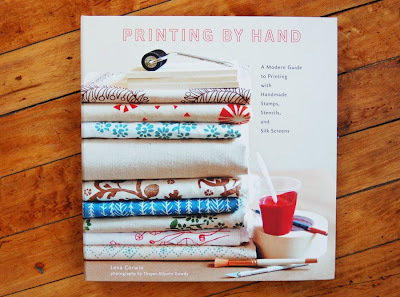 Must add it to my ever-growing list of craft books to buy. This book looks excellent. Thanks for giving the extra away! 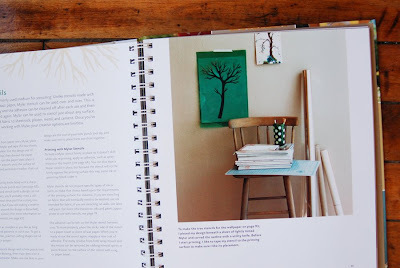 I've been dreaming of painting on my living room wall somehow, and my guess is that this book would be just the thing I'm looking for to help me start the project! This books looks right up my daughter-in-laws alley. She is so talented and does a myriad of crafts. I'd love this book for a Christmas gift. I may be too late to post a comment but thought I would anyway. Wow, this book has been on my wishlist for some time now... I had the change to see it when I was in NYC in August and I LOVED it!! Oh I love book week as I'm not able to really do any sewing these days. Thanks for the giveaway! Now that DOES look like an awesome book! thanks for the awesome giveaway! I'm reminded of the time my then toddler came out to me with a multicoler pigment ink pad in ocean colors, likd off, and hands covered in blue and green thick pigment ink, pad in one colorful hand, other colorful hand held out to show and then reaching to touch anything and everything in sight . . . . . . before I cleaned her up I got some "prints" off of her for a scrapbook page about the incident, figure I may as well make use of the mess, lol! And have proof, for future blackmail, hee hee. I have pictures ,too, and you can see this colorful wet pigmented hand just reaching for the camera lens . . . . . as of course those inks take forever to dry!!!!! Have you already given this away? I'm hoping to make new cushions for my kitchen chairs out of stenciled, stamped, or otherwise printed canvas dropcloth... but honestly I have no idea what I'm doing! I'd love to learn via this beautiful book. I'm really into this book since I saw it days ago. It's a good treat of life.